The Hotel Fred: Merry Christmas! 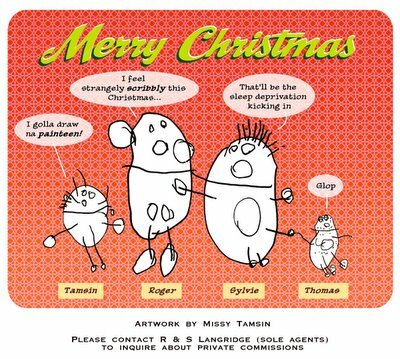 This year's Christmas card, which I diligently produced and then completely failed to mail to anyone. Drawings courtesy of my daughter Tamsin, just turned three. man thats great art from a 3 year old. Do you 'school' her when she has the crayons out? Not really. We encourage her and take an interest in her drawing, naturally enough (proud papa! ), but she started doing these potato-men all on her own. Ats-a my goil! The spam filter is back on because it just goes berserk if I switch it off. Sorry - I'll get to your comments ASAP! Eisner and Harvey Award-winning cartoonist responsible for The Muppet Show Comic Book, Thor the Mighty Avenger, Snarked! and Fred the Clown. Would like to save the world through comics. Buy the new "Zoot!" from the web store! Buy "The Iron Duchess" from the web store! Volumes 1 and 2 out now!